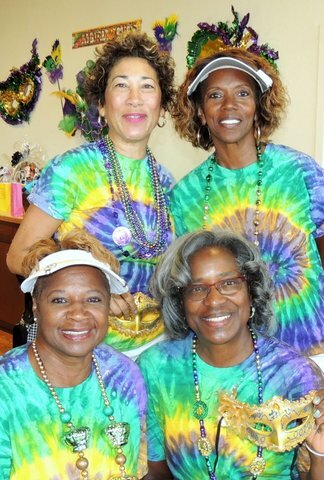 SOTL and Blue Rock Springs (BRS) Women’s Golf Club (Vallejo) members Debra Batiste, Marie Poole, Eunice Coffey, and invited guest (Membership Chair) Nancy Sanders, placed 4th in the BRS 2015 Annual Invitational Tournament, on August 27, 2015. This is the fifth year of participation as SOTL representatives, where this foursome consistently places in the top 4. Pictured they are dressed in this year’s themed Mardi Gras inspired team wear, coordinated by our SOTL Uniform Chair, Debra. Fellow BRS and SOTL member, Vanita Finney and SOTL Lesley Stewart also played in the tournament; Lesley received the closest to the pin prize.